← Did ‘Snow White and the Huntsman’ steal the forest scene from Princess Mononoke? It’s that time of year again. And before I go any further, big salute goes to the tourney staff s who labored for months and finally made the tourney happened again, this time bigger and probably better. As you might have guessed, the final bracket has just arrived and I, as always, have more than a few things to say about it. First of all, the bracket looks pretty and well organized. I like how the contenders are divided into groups of different color. I also like the new style of matching. Even though I was skeptical about four blogs being voted in single poll, the final results looks like a good idea. Two out of four blogs based on preferential votes would go on to the next round. Being able to vote 2 blogs gives the voters a nice choice and the underdogs a nice chance. Top tier blogs are also well spread out over the bracket. This event will surely get me, along with other readers and bloggers, to know new blogs. It will also make anime blogging so much more fun. I feel really excited and revitalized. The top 16 seeded blogs are supposedly placed in the third round and the rest placed in the second. But I am dying to know the precise seed ranking for this tourney. Unfortunately, the bracket does not show the ranking for each blog. Maybe it’s just me but it seems like the Red Bracket is the weakest of the four brackets? Of course, it is nearly impossible to prevent discrepancy of strength among hundreds of contenders. And I am not saying the seeded players in the Red Bracket are bad or inferior (glances fearfully at Baka-raptor). I only think that the lower seeded blogs in this bracket have the best chance of breaking through the four-way round or beyond. 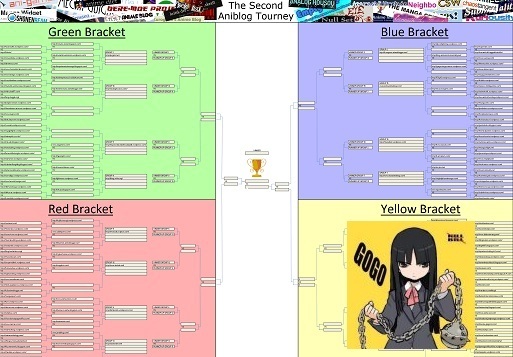 There’s no psgels, Kurogane or Seaslugteam in this bracket. This has nothing to do with the tourney staff. I am just saddened to see, despite the number of blogs participated, that many familiar faces from the first Tourney had disappeared (about 30 from 96). Some were close to me. I feel a little lonely for a moment. But things have to change and lives (blogs) go on. 1. The Blue and Yellow brackets are virtually locked. 2. The bottom half of the Green bracket remains to be seen (but all hope is lost against psgels). 4. A lot more drama and clashes among bloggers and readers. 5. Don’t forget to keep an eye on me in the Yellow bracket, too! Remember, my avatar is also yellow (GoGo Yubari FTW!). This entry was posted in Articles, Talks and tagged Aniblog Tourney, anime, anime blogger. Bookmark the permalink. Wow! Commentary on the tournament.. I really should write more, but I’m tired. I’m in the blue bracket >.> I hate my life. Still, the competitive side of me is burning with anticipation. I can’t wait to fight with all of my abilities! Nothing is absolute when it comes to dealing with large group of people. So hope remains, however unlikely it may initially seem. Let’s not give up! Ah yes, this fiasco. Well, I’ve been around long enough that my opinion isn’t valid, so I’ll likely not pay attention to this once again. But I wish you luck. I will meet you all in the finals. I will steamroll anyone who dares cross me path. I am the ultimate underdog. There is no blog that I cannot def– hahaha, I can’t do this, I’m out in 1 (2, if I’m lucky) round. No way the coloration is a coincidence. My blog’s theme is blue and I ended up in the Blue bracket. Gonna be tough for me to even take 2nd from certain competitors, but will be interesting to see how that goes. Good luck to us both! But who will that surprise favor? Well, at least there will lots of blood to watch! If your avatar is any indication, you will be eliminated from this tournament by having your head impaled by the leg of a table or chair. It’s too bad. But you are right, I am a lock to win yellow. Every one dies eventually. In GoGo’s case, she has slaughtered countless men by cutting their guts open before meeting the Bride. So far I haven’t seen The Bride yet! Yeah, the number of blogs that died since then is kind of disturbing… It’s mostly because of either the lack of time, motivation or blogger burnout. This is probably a main reason I limit myself on covering series and focus more on quality over quantity when it comes to posts. Good luck! At least you got a first round bye so that’s a good start. I’m starting to read commentaries like this to know more what exactly is the Aniblog Tourney and I’m finding it interesting. Btw, good luck to you. From what I’ve heard there have been some cases in the past in which blogs were getting hate messages. What do you mean by “locked”? Well, I won. Which means, if I read the bracket right… I am facing you next. Shall I commit suicide by cyanide or hara-kiri? I can’t say I don’t want to win but in the end, it doesn’t matter that much. It’s an honor to meet you in the second round!